Mackworth Castle was probably a medieval timber framed manor house, founded by Mackworth family. Sadly all that remains, is the facade and part of the outer side walls, of a 15th century turreted two storey gatehouse, which fortified the courtyard of the manor house. The round arched central gateway, originally guarded a northern platform, which supported a large house. Inside the gate are modern brick outbuildings, they have replaced the guard chambers or porter's lodges, that contained the stairs to give access, to the large first floor chamber. Below the crenellated parapet and corner turrets of the facade, are carved stone heads and waterspouts, square-headed, two light windows and the chimney stack of a fireplace. 6 miles north-east is The Mound, Morley Motte and 11 miles south-east is Melbourne Castle. 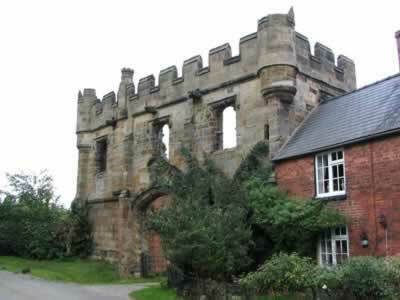 Mackworth Castle is located in the village centre, off Lower Road. 3 miles west of Derby, on the A52.